Join the discussion on our forums! Come discuss A New Challenger... over in our dedicated A New Challenger... discussion topic. Discover a 6-Cost minion. Summon it with Taunt and Divine Shield. … Arrives? Approaches? TELL US ALREADY! Playing with this during a prerelease fireside gathering made me realize just how inconsistent this really is. It can be really hard to highroll sometimes. There's a couple low rolls but honestly most of the 6 drops seem OK if you give them taunt and divine shield. I think this is a solid card with obvious synergies with Shirvallah, the Tiger. Anyone got a list of all the bad options? I had gone to find this info and seeing someone else go through the effort to type it all out warms my heart. Good card, though boring. Just a 7 mana pray to RNGesus to save your match. Sinergizes with the Loa which is pretty nice. Hm. To be honest, we will need good and expensive spells to make Tiger more viable. Is this the one that does that? No, it's not enough. I do agree that it can be a good stalling tool and it';s okay if you have an upper hand too. If control will be a viable archetype, this card might see some play. Right behind mana 8, 6 has the best random minions. Taunt and divine shield is amazing for immediate impact. will see play, needs zero support. I dunno if this is good, but I like it. There are some massive highrolls possible, like Cairne Bloodhoof, Damaged Stegotron, maybe Blackguard. It's also an odd "control" card which might enable a non-aggro Odd Paladin, both by providing a decent body, but also by reducing the cost of Shirvallah, the Tiger. It probably doesn't really work out, but Discover is a fun mechanic, and giving a discovered minion taunt and divine shield is a great way to make some "misses" at least acceptable. 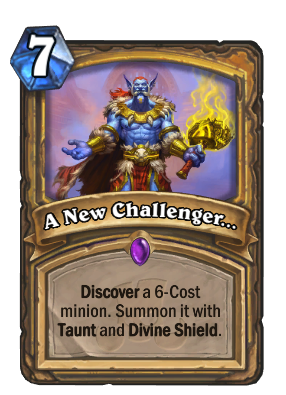 You can see all of the potential results from this card here, keeping in mind that there haven't been any 6-cost neutral or Paladin minions revealed from this set yet. Some of the hits are quite good — in particular, anything with 6+ attack or 9+ health seems solid, as well as all the deathrattles save for The Beast and maybe Spark Drill — but a low roll might see you picking between Arcane Dynamo, Glowstone Technician, and Gadgetzan Auctioneer or Spellweaver. It's certainly an interesting card; time will tell if it's any good, but tentatively speaking I like it. Boys don't forget Sylvanas in wild! How can You think this card is any close to VERY GOOD? Its an arena card AT MOST. Don't forget that discover options are in favor of class-specific cards and NEITHER of paladin 6 drops is good enough for this spell. And then go look at 6 mana neutral minions. everyone sees fun in their own way. I'm not saying it's bad to print cards solely for arena reasons. I do actually think it's good for the game. But constructed wise it's too bad unless we'll see more spell-paladin support. MAybe we get some random spell generation in Pally, then we might see some funny moments. honestly even the worst case scenarios aren't that bad if you use it as a stalling tool. Probably too unreliable for constructed though. The idea of getting a Blackguard, Boulderfist Ogre, Cairne Bloodhoof, Spark Drill, or The Beast with Divine Shield AND Taunt is hilarious.